Make your own vintage papercraft robot with our free printable PDF template! It’s easy! Just follow the instructions & you will be proud of your 3D robot. This model is perfect if you are an absolute papercraft beginner! Don’t be afraid, it is free, and I assembled the robot myself, so everybody can do it! You will just need time & precision. Put your music on & enjoy the assemblage! (For me it is a perfect way to relax). 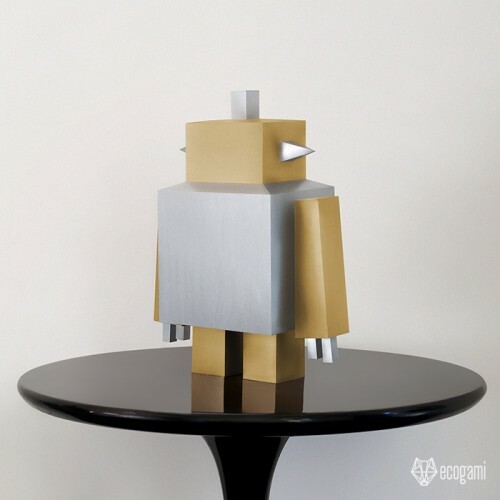 ► Once finished, you can customize the sculpture according to your taste. The customization options are infinite! You can color each face with felt-tip pens to make them multi-colors (I did it for several models). Or, you can paint it to make it stronger & easier to be cleaned. With an oil paint or even spray paint, the robot will look like laminated & your friends won’t believe you made it with paper! ► Difficulty Level: Easy – The fingers of the robot and closing the sculpture require more precision and patience.